The end of the ‘90s was a time of healing for Korn vocalist Jonathan Davis. After a decade of indulging his most dangerous and depraved rock ‘n’ roll fantasies and suffering a breakdown at the end of the ride, Davis decided to get sober and tone down his extracurricular activities. In conjunction, Korn hired dedicated studio producer Brendan O’Brien to help them stay focused and work at peak efficiency. 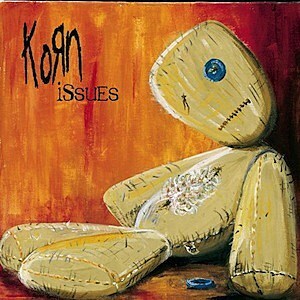 The resulting album, Issues, came out on Nov. 16, 1999, and kept the band on an upward career arc. While Davis remained clean and sober in the wake of the success of Issues, other band members saw their popularity as an opportunity to up the ante on their rock ‘n’ roll indulgences, causing friction and turmoil that peaked years later with the departures of Welch and Silveria. Purpose is the fourth studio album by Canadian singer Justin Bieber, released on November 13, 2015, by Def Jam Recordings and School Boy Records. The album was preceded by the release of the worldwide number one lead single “What Do You Mean?” (released on August 28, 2015), and the record-breaking second single “Sorry” (released on October 21, 2015). The third single “Love Yourself” was also a success, reaching number one in the UK and New Zealand and the top ten in Australia and the United States. It debuted at number-one on the Billboard 200 chart, selling 522,000 copies in its first week of release. This gave Bieber his sixth number one album in the United States following Believe Acoustic (2013). “What Do You Mean?” was released as the album’s first single on August 28, 2015. Upon release, the single became Bieber’s first number one single on the Billboard Hot 100 chart in the United States, debuting at number one on the week listed on September 19, 2015, replacing The Weeknd’s “Can’t Feel My Face” for one week. “Sorry” was announced as the album’s second single on October 16, 2015. It was released on October 22, 2015. It was produced by Skrillex with the collaboration of DJ and producer Blood Pop. The song is an uptempo dance-pop song with lyrical material about a troubled relationship and Bieber asking for forgiveness. The song has so far peaked at number 2 on the United States and Canadian charts. It peaked at number one on the UK Singles Chart five weeks after its release. Moreover, the single has peaked within the top five in almost every other market. “Love Yourself” originally entered several national charts after the release of Purpose, and had become a huge success around the globe prior to its release as a single, peaking at number four on the Billboard Hot 100, number two in Australia, and number one in New Zealand and the United Kingdom. The song was announced as the third official single on December 7, 2015. “I’ll Show You” was released as the first promotional single on November 2, 2015, accompanied by a music video. The album also features Bieber’s collaboration with Jack Ü, “Where Are Ü Now,” originally released as a single from the latter’s album, Skrillex and Diplo Present Jack Ü. Eight songs from the album charted in the top 40 of the UK Singles Chart the same week that the album was released (November 13-November 19). They were, in order of chart appearance, “Sorry”, “Love Yourself”, “What Do You Mean?”, “I’ll Show You”, “Company”, “Where Are Ü Now”, “Mark My Words” and “The Feeling”. Bieber set a record for having the most simultaneous top 40 entries from a living artist. In addition to this, every song from Purpose (standard edition and deluxe edition bonus tracks included) charted within the top 100, also within the same week. Bieber has claimed three consecutive number one singles from the album in New Zealand and the United Kingdom, with “What Do You Mean?”, “Sorry”, and “Love Yourself” all reaching the summit in the duration of just three months. Bieber debuted the track “What Do You Mean?” during the MTV Video Music Awards on August 30, 2015. This was followed by a number of other televised performances, including The X Factor, The Today Show, The Tonight Show Starring Jimmy Fallon, and the 2015’s Think it Up telecast. On October 16, 2015, Purpose was made available to pre-order. A remixed version of “What Do You Mean?” with additional vocals from Ariana Grande was made available to those who pre-ordered the album on iTunes. Purpose was initially banned in various Middle Eastern countries and Indonesia due to the cover art’s heavy Christian references, most prominently Bieber’s cross tattoo and his praying stance, which were deemed “too provocative.” An alternate cover was issued for these countries, depicting Bieber atop a cliff, looking out over a shore. On October 28, 2015, Bieber announced the album track listing through a series of tweets that displayed each title graffitied on a wall in various countries. On November 11, 2015, Bieber announced that he will embark on a tour supporting the album called Purpose World Tour. The tour will start in Seattle, Washington on March 9, 2016. A competition between Bieber and One Direction began when the British boy-band announced the release date of their album Made in the A.M. set to be their last work before their hiatus in March of the following year, which was the same as Bieber’s come-back album. Putting the album on iTunes pre-order one month earlier than Bieber, the boy-band started the first week with a 60,000 units lead. Many compared the “war” between the two pop forces to 50 Cent and Kanye West’s 2007 battle for number one. However, Bieber’s Purpose debuted at number one on the Billboard 200 chart for the week ending November 19, 2015, with 649,000 equivalent album units, of which 522,000 were pure album sales. It marked Bieber’s sixth number-one album and largest sales week. It also surpassed his previous high, logged with Believe, which sold 374,000 units in 2012. Additionally, Purpose ’​s debut marked the largest weekly unit total for an album since the Billboard 200 began tracking popularity based on overall equivalent units earned in 2014 and beat the debut week of Drake’s If You’re Reading This It’s Too Late (which sold 535,000 equivalent units in 2015). Also, Purpose ’​s 522,000 mark the largest sales week since Taylor Swift’s 1989 debuted with 1.29 million (November 2, 2014) and the largest for a male artist’s album since Eminem’s The Marshall Mathers LP 2 sold 792,000 (November 3, 2013). Purpose also broke the global and US streaming record for an album in its first week of release with 205 million global streams and 77 million in the United States. In its second week, ‘Purpose’ earned 290,000 units (down 55 percent). It sold 184,000 in traditional album sales (down 65 percent) and was beaten to the top by Adele’s 25, which debuted at number one with a record-breaking 3.38 million. Purpose debuted at number 2 on the UK Albums Chart, selling 90,596 in its first week, marking the second highest first-week figures of 2015, at the time, behind One Direction’s Made in the A.M. (2015), which debuted at number one the same week with 93,189 chart sales. In its second and third week on sale it stayed at number three. In its fourth week, the album slipped one place to number four. However it actually sold more in its fourth week by selling 91,182 compared to 90,596 in its first week. We have sad news to report, as former Motorhead drummer Phil ‘Philthy Animal’ Taylor has passed away at the age of 61. The stickman anchored the band behind the kit for a total of 14 years, enjoying two stints with the group, laying it down on several of the uncompromising outfit’s highest-regarded albums. Celebrated Motorhead guitarist Fast Eddie Clarke posted a tribute on his Facebook page with the news. Clarke played alongside Taylor from 1976 to 1982, rounding out the classic lineup with mainman Lemmy Kilmister that released Motorhead’s first five albums. Featured on every album up through Another Perfect Day, including classics like Overkill and Ace of Spades, Taylor split from the band in 1984 only to join three years later and depart once again in 1992 after playing on Rock ‘n’ Roll and 1916. His playing bordered on unhinged, fueling the Motorhead engine with his reckless yet refined style that was essential to the band’s attack. Protected: Brand New Winter Hats And Scarves From Bravado USA! November 12, 2015 by Break-Thru in Wholesale Only | Comments Off on Protected: Brand New Winter Hats And Scarves From Bravado USA! Protected: Amy Winehouse Racerback Tank! Back by popular Demand! November 11, 2015 by Break-Thru in Wholesale Only | Comments Off on Protected: Amy Winehouse Racerback Tank! Back by popular Demand!